The following should not be taken as a recommendation (or warning) regarding Precision Stem Cell. However, that facility was recently rendered an injustice which requires correction. On March 19, 2013, ALS Worldwide (ALSWW) published a report on the procedure carried out by Dr. Jason Williams at Precision Stem Cell in Gulf Shores, Alabama (PSC). The report was particularly scathing. However, it was replete with inaccuracies. I would like to contrast points from the ALSWW report with facts reported to me from a number of independent sources which include Dr. Williams, persons who have visited his clinic, and patients treated by Dr. Williams in the subject stem cell procedure. To begin with, I will briefly explain the theoretical underpinnings of the procedure Dr. Williams performed, as well as his motivation for doing something outside of his original medical training. Dr. Williams explains his history, procedure, rationale, and plans for development in a recently-released video. He had been doing mesenchymal stem cell (MSC) extraction and delivery into joints for a time, a somewhat routine procedure done in many clinics as a sports rehabilitation therapy. A friend, Frank Orgel, approached him about trying the procedure to treat his own ALS. Dr. Williams was initially skeptical but after online literature research learned of studies done using this technique in laboratory settings. Note that the link here is not necessarily the one used by Dr. Williams. The reader can search PubMed using the terms “autologous stem cells amyotrophic mesenchymal” and be presented with results which are representative of the applicable published studies. Selegiline (Anipryl, L-deprenyl, Eldepryl, Emsam, Zelapar) is a drug used for the treatment of early-stage Parkinson’s disease, depression and senile dementia. Dr. Williams found published studies suggesting that selegiline treatment of MSCs was sufficient to trans-differentiate them toward a neural lineage. Dr. Williams extracts the MSCs via machines made exactly for the purpose of extraction of adipose (fat) tissue and real-time separation of MSCs from the adipose tissue. The extraction and separation process is all done in a sterile closed system. The MSCs are then bathed in selegiline solution created by from powder mixed with sterile saline using a professional compounding protocol. After treatment, the cells are then injected into the spine via lumbar puncture The idea is that the treated cells are a mixture of MSCs and neural-lineage cells which then quell the inflammatory aspect of ALS and provide neurotrophic factors. The extent and duration of benefit is presumed based on severity of progression (ie patients with a slower, less aggressive, progression would experience more benefit and of a longer duration). TCA Cellular of Louisiana had been previously conducting a clinical trial using intrathecal delivery of MSCs to treat ALS until they were shut down for improperly administering the procedure outside of trial (including allogenic products delivered to some patients). Currently, The Mayo Clinic is conducting a similar trial. Clearly there is scientific rationale for investigating this procedure as a treatment for ALS. While Dr. Williams started with the cart before the horse, if you will, he has matured his operation into a true investigative research program. He is partnering with accredited researchers and is forming a company specifically to handle the research program. Together they are working on a genetic modification of the MSCs to more abundantly deliver anti-inflammatory and neurotrophic factors as well as concurrent delivery of the treatment vehicle to the patient cells to help the host cells defend themselves from disease process. This can be likened to the Brainstorm product which nearly everyone is excited about. As discussed above, Dr. Williams never claimed that his procedure was a clinical trial. He expanded his current practice of treating joint damage to ALS by request of a friend seeking the possibility of relief via MSC injection. Labeling the procedure as a “trial” and then remarking that there is no rigorous data collection is disingenuous at best. Further, discussion of pricing in the report appears deliberately worded to taint Dr. Williams as a con artist of the sort endemic in the world of life-threatening diseases. Dr. Williams is indeed now planning a trial, in preparation for which he has ceased treating patients, but none of the previous treatments were ever represented as a trial. Dr. Williams had been planning to transition to a trial many months prior to the ALSWW visit. This is true. However, neither of these qualifications are necessary to perform the subject procedure. Mechanically it is almost no different from the joint therapy he has been performing for years. Injection into the spine does carry extra risk. However, nurses without neurology credentials routinely administer spinal taps and injection of spinal block anesthesia daily around the United States, and without benefit of the imaging equipment employed by Dr. Williams. Insofar as the liposuction, Dr. Williams is certified in the use of that equipment since 2010 and can produce a copy of such certificate upon demand. While the positive effects noted by some patients could indeed merely be placebo effect (impossible to determine either way absent double-blind trial), how Mr. Byer makes this claim is a puzzle. He never contacted any of the patients referred to him by Dr. Williams. The “days” time estimate Mr. Byer repeated in the ALSWW report appears to have come from a public post from a person on the ALSTDI forum. That person denies having been contacted by Mr. Byer. Leaving aside a discussion of exactly what a “stem cell facility” is, PSC is a radiological facility. No surgical procedures are performed. The equipment used to extract, manipulate, and reintroduce the MSCs are all routine equipment useful in many procedures involving filtering and extraction of select fluids/tissue. The protocol for harvesting MSCs has been well-documented for decades. The liposuction and extraction are done with machines built exactly for those tasks in a closed system which guarantees sterility. The mention of the equipment not being FDA-approved for extracting MSCs is a total red herring apparently intended to taint the reader’s opinion of PSC. Sterile procedures are indeed not followed. The reason for this is that they are unnecessary. The entire movement of cells is done via hypodermics, transferring from the patient from one sealed sterile container to another throughout the entire process and back to the patient. Alcohol swab wipe on external surfaces prior to injection is all that is necessary. There is no open surgery requiring a sterile environment. Despite the claim in the ALSWW report, surgical drapes are indeed used during liposuction. Talking about the radiology suite as an “OR” is another disingenuous attempt to discredit PSC. 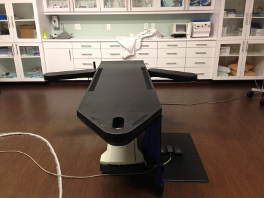 The table talked about is a standard flouroscopy table so Dr. Williams can use imaging guidance for his procedure. Photographs reveal the table to be very clean and in fine shape. Since patients are not under general anesthesia or sedation, the risk of “easily falling off” is a function of zero. This claim is a mystery because the patients to whom Dr. Williams referred Mr. Byer deny having been contacted. The patient Mr. Byer apparently used in this example denies having been contacted by Mr. Byer. Further, he maintains his original statement. Dr. Williams uses an 80 micron filter. It is possible that Mr. Byer was observing another filter type or misread the label. Dr. Williams admits the possibility of having handed Mr. Byer a 0.8 micron filter by accident. Nevertheless, this question could have been resolved by email or phone call prior to publication. The selegiline is not, as claimed in the ALSWW report, ground in a mortar and pestle at PSC. The selegiline solution used for bathing the MSCs is made with sterile saline (not distilled water) under the guidance and protocol of David Rothbardt, a registered compounding pharmacist. According to Dr. Williams, neither Mr. Byer nor his medical adviser Dr. Hematti ever observed compounding of selegiline at PSC. Further, the selegiline is removed via rinse after bathing period and prior to reintroduction to the patient. Perhaps Mr. Byer has confused PSC with a biohazard facility? This allegation makes no sense and appears another in a long string of comments included to confuse the uninformed and unwary. As demonstrated above, the report by ALSWW is full of inaccuracies, misrepresentations, and diversions from truth. The motivations for Mr. Byer to publish that report are beyond the scope of this blog post. The facts are that PSC is a clinic offering a treatment used by many clinics for joint rehabilitation. The equipment and techniques are common and well-documented. The facility is clean and the procedure is carried out under appropriately-sterile conditions. The applicability of this treatment to ALS is unknown, although the study data available is compelling enough for The Mayo Clinic to run a clinical trial. There are some questions regarding the treatment provided by Dr. Williams. The dosages administered are estimates based on instrument capacity rather than actual flow cytometry count. The data regarding selegiline needs further independent verification. Without evaluation, it’s impossible to know how complete is the presumed process of trans-differentiation of MSCs to neural lineage. The efficacy of either straight or selegiline-treated MSC intrathecal injection is still an open question. However, one thing is clear: PSC did not deserve such a baseless derogatory review from ALSWW. Two new studies came out that I found rather interesting. The ability to transfer into humans is years off but the progress is still impressive. First up, a team at the University of Toronto developed a new technique to expand stem cells at industrial capacity. Second, Children’s Hospital of Philadelphia generated a new human stem cell type called an “endodermal precursor”. If the new stem cell technique can also be used to generate ectodermal precursors, it could be a major advancement in regenerative therapy for ALS. Many additional steps would still be necessary but mass-production of teratoma-free cells would be an important contribution. First off, there is some wonderful news: Diaphragm pacing system receives FDA approval for use with ALS patients. This is a device which extends time until vent by electrically stimulating the diaphragm. Note that this will not replace a vent as the diaphragm muscle needs neurons to release acetylcholine to the muscle fibers in order for them to contract. However, I urge all PALS reading this to immediately begin talking with your neurologist about whether this would be right for you. Here is some good information regarding the DPS. Next up is the recent news regarding the Neuralstem trial involving stem cells implanted in the spines of PALS. Readers can see a poster-style synopsis of current trial data here. The initial results are encouraging, and one patient has even shown improvement. The next step in the trial is cervical implantation where the cells will have the chance to impact the phrenic nerve (the “money” nerve that serves the diaphragm and breathing). There is still much to learn about this technique before it is available to but a few. Remember that this is still a safety trial. I would urge readers to consider the words of Neuralstem’s CEO. Some more very good news for PALS in the USA: Brainstorm is bringing it’s stem cell clinical trial to the US! This technology, named NurOwn, uses a patient’s own mesenchymal stem cells to produce little factories for neurotrophic factors (proteins that nourish and strengthen neurons). This would provide a constant and lifetime production of support for the neighboring neurons, a much more effective approach than drugs which are only present for a short time or may be reduced or blocked by the Blood-Brain-Barrier. Note that this is not a replacement therapy, but rather one to help feed and protect existing neurons. You can read about the trial protocol here. For recently diagnosed patients they will inject into muscles to try to take advantage of axonal uptake in the hope that this will preserve the axon and its attachment to the muscle (neuromuscular junction). Patients in later stages of disease will have an injection into the spine to treat the neurons’ cell bodies directly. In 2006, mouse fibroblasts were successfully transformed from a fully differentiated state to a state of pluripotency. These cells were designated induced pluripotent stem cells (iPSC).Since that news, human cells were successfully transformed and techniques to increase the safety and efficiency of production have been found. Other techniques have been developed which can correct genetic defects in iPSCs with the eventual goal of repairing or replacing defective tissues. other complications such as efficiency (allowing sufficient numbers of cells to be generated within a clinically acceptable time at a clinically acceptable cost). Some of these issues are already being addressed and quite frankly the pace of research has been astonishingly rapid. iPSCs are already being used to model disease and aid drug discovery. Due to the novelty of cell-based therapies and the fact that implanted cells are difficult or impossible to remove (unlike dosages of drugs which can be ceased in the event of adverse reaction), regulatory hurdles are necessarily high. However, as more trials are performed giving more data on safety these hurdles can be lowered somewhat and/or more easily surmounted. There are cell-based therapies already in or going through the regulatory process for trials using a variety of stem cell types. Not only do these prospective treatments face regulatory hurdles, they must also cross the Valley of Death of pharmaceutical research. Some researchers are finding ways of doing this on their own with intellectual property partnerships, and the NIH has been working to bridge the gap with new programs such as TRND. This is a very exciting time for regenerative medicine. The concept of “self” is critically important in the immune system. Each of our cells present a unique set of molecules on their outer walls which signal to our wandering immunity police that they belong (“your papers, please”). Any other cells not presenting the same combination are considered foreign invaders and are attacked (“your papers are not in order!”). This works great for resisting infection but is a major impediment to transplant surgery. Even “tissue matching” is inexact, requiring recipients to have their immune system forever after repressed in order to maintain the graft. Finding a way to allow for a graft of desirable foreign tissue but also maintain a robust immune system is a therefore a major goal. A stem cell research grant by theCalifornia Institute of Regenerative Medicine has a quite novel approach: regenerating the thymus, the “police academy” where the immunity cells learn to recognize the body’s own cells from foreign invaders. The thymus atrophies in adulthood, so regenerating it from stem cells from an appropriate HLA line might trick the immune system into accepting the graft with the same HLA type. Quite a clever approach, and yet another reason that I am glad to have voted in favor of forming CIRM (ironically shortly before I was diagnosed with ALS). In June I posted a discussion about a prospective regenerative therapy. On December 1, I received a press release that the company developing this therapy has filed an IND with the FDA. This is a huge step forward for people suffering from motor neuron disease (especially late-stage PALS like myself). However, it is but the first baby step in the clinical trial journey. Let’s hope that the FDA acts swiftly and positively on this IND.